There are literally billions of apps available in the iTunes app store for your iOS devices and of course the number keeps increasing almost on a daily basis. We currently live in a world that’s just beginning to discover the power of mobile devices and their applications. Our cell phones/smartphones and computing devices are taking over every aspect of our lives via these applications and the trend is now un-stoppable. The proof of the phenomenon lies in the facts and figures that keep emerging out of various sources about our app craze. The latest research and its results that support the above scenario have just been released by a Helsinki based app developer and industry analysis and advisory firm, Asymco. 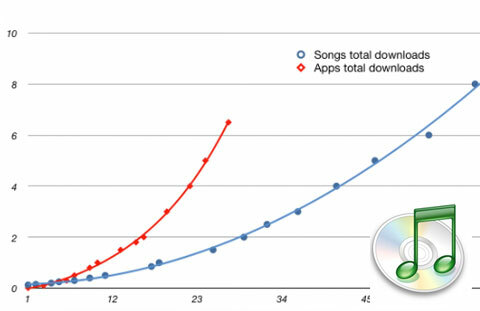 The company posted a chart on its blog which shows the download rates and trends for music and apps on iTunes and it clearly shows that users are currently downloading applications faster than music and the total number has already reached the same level as that of songs in less than half the time. These figures are based on data from the recently updated Music and App Stores and Asymco points out that it took roughly 2.2 years for the App Store to serve up 6.3 billion apps, while it took approximately five years for the iTunes Music Store to reach that same number. Asymco posted another chart last week depicting how music downloads are slowing down compared to apps on iTunes and now it predicts that if the current trend for both stores continues, it’s likely that app downloads will overtake song downloads by year’s end.